Bradley University’s student ID card, the QuickCard, has received an overhaul in both design and function after implementing contactless technology and phasing out legacy features. As reported by The Bradley Scout, the university began issuing the new QuickCards late this summer. As part of the ID card overhaul, the university will drop Discover Debit functionality at the end of the year and has added a preferred name option for students to be printed on the front side of the card. “This year, we were notified that Blackboard wasn’t going to be supporting Discover Debit any longer,” said Mona Hutchison, director of Systems Integration in the Controller’s office, in a Bradley Scout interview. Students that previously activated the Discover Debit function and still have funds on the account are encouraged to take appropriate steps to zero out the account balance. Any funds still in an account after December will be returned to students’ home addresses in the form of a check. 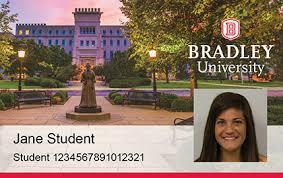 The new Bradley University QuickCard. Also core to the new credentials is the addition of contactless chip technology. “The new chip allows us to integrate different security measures, which is important as we are looking into building new facilities and expanding physical security on campus,” said Brian Joschko, Bradley University Police Department Chief. In April 2017, the university announced that it was working with Blackboard to update its access control system and eliminate the use of the magnetic stripe. The university has since deactivated mag stripe functionality for physical access, and this summer replaced the last remaining exterior mag stripe readers at residence halls and parking lots to contactless readers from Blackboard. The card design has also been refined. With its previous cardstock, Bradley was handcuffed when it came to card design, but the removal of the Discover Debit component provided the university with more creative freedom for a new aesthetic. The front of the new design features a picture of two university landmarks — Bradley Hall and the Lydia Moss Bradley statue – as the background. The new design also includes a student photo and prints any preferred names on the front of the card. Regardless of preferred name or not, the back of every ID includes the student’s full legal name. In addition to contactless capabilities, the cards also feature a mag stripe for interior door access and printing services, and a barcode for library and student activities office use. Bradley also prints the phone numbers of the QuickCard office, health services and counseling, and the university police department on the back side of the cards.